There is a bizarre nostalgia that affects people when they discuss Wayne Rooney. The prevalent view seems to be that he had all the talent in the world, demonstrated it with carefree abandon during his teenage years and then got spoiled by necessary on-pitch self-sacrifice and voluntary off-pitch self-sabotage. Now he is seen merely as a good player – not a genuinely great one, and certainly not the one we thought he would be. This sudden about-turn in public opinion does not really tally up with what has been written and said about him up until now. Throughout his Manchester United career his performances have received glowing write-ups in the press and when he has underperformed – and it has happened repeatedly, sometimes for months on end – his industry and work-rate have seen him bundle in goals and escape the harshest criticism. Perhaps it is a British journalism thing – “build ‘em up to knock ‘em down” and all that – but the idea that Rooney has not fulfilled his potential is quite ridiculous. As a conclusion, it is simply unfair. Sure, he has never hit the heights expected of him and his contribution to football pales in comparison to those of era-defining freaks Lionel Messi and Cristiano Ronaldo, but the reality is that he was never going to match them. The problem lies not with Rooney but with us, his viewers. It is not that he never made the most of himself but more that we overestimated his talent to begin with. We built him up to be a bona fide genius – ‘the White Pelé’ – and that is something he never was. What he became, really, is more than twice the player he promised to be. On Saturday morning, Miguel Delaney shared the below video of Rooney’s performance versus France in Euro 2004, along with the caption ‘the frighteningly good player he never became’. How Delaney watched it and reached that conclusion is beyond me. It is impossible to analyse this showing and determine that Rooney was a better player in 2004 than he is now, nor a more watchable type. There is the run through the middle to win the penalty that David Beckham missed, as well as a couple of nice lay-offs, but otherwise he accomplishes very little – next to nothing, in fact. The more one watches his performance, the more one realises just how genuinely bad it is. He loses the ball due to heavy touches with infuriating regularity, embarks on countless ill-advised and technically inept dribbles and could have been sent off for dangerous play on at least two occasions and foul and abusive language once. Sure, it may have been exhilarating at the time to watch a kid charging around like a headless chicken, fearlessly and often literally trying to trample over a back five that included three World Cup winners, but that was not his job. His job was to play football and what Rooney played was not football. Perhaps it passed for football in Liverpool’s playgrounds while he was growing up, but at the top level – in a European Championship, no less – a lot more is required than adolescent rage, raw physicality and a good deal of stamina. The attributes that Rooney has since developed – a sense of timing, occasionally incisive long-range passing and relatively ice-cold composure – make him a far better player now than he was back then. Those who yearn for televisual spectacle over sporting success may wish he had never been introduced to the strategic elements of the sport, but he stood a far better chance of maximising his footballing potential by taking that route than by continuing to charge around raking his studs down the shins of defenders and conceding possession whenever the ball fell his way. I have never been a Rooney fan – and I would still rather have the rather less successful Adel Taarabt in my team, truth be told – but it is high time that we accepted that his flaws were there from the start, never to be fully corrected. Rather than criticise him as though he has let us down, we should accept that it is a miracle that he turned out this good. After all, he has scored over 200 goals for Manchester United without ever possessing something as basic as a reliable first touch. Put it this way: the same gormless man-child who repeatedly falls over the ball in the video above somehow went on to play the below pass for Robin van Persie to score a Premier League-winning goal. The Rooney of 2004 better than Rooney of 2014? Not even for a second. 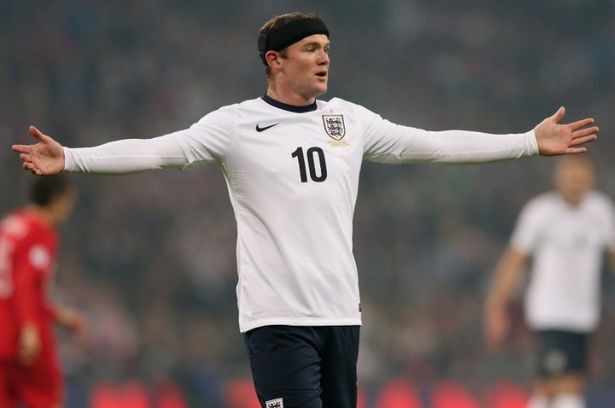 The Rooney who was going to take the world by storm and retire on a par with Pelé and Diego Maradona? Well, the truth is he never even existed. This entry was posted in Player profiles and tagged champions league, david moyes, england, euro 2004, france, manchester united, old trafford, pele, premier league, robin van persie, wayne rooney by Rob Brown. Bookmark the permalink.